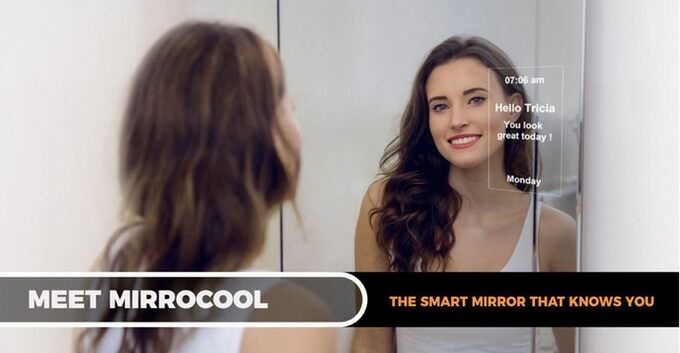 One of the newest kickstarter ideas out there is the interactive smart mirror that goes by the name of Mirrocool. An overview of the features included represents a presence of personal assistant that lives inside your mirror, acting as a reminder, a clock, a PA and even as a camera. The main purpose for this product is to basically illustrate all the events and activities you have planned through your day. Implementing the technology inside of a mirror was inspired from the constant usage of it daily, in any household. 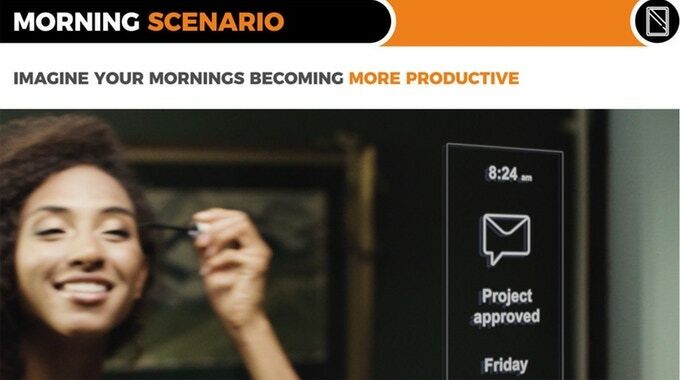 These countless minutes wasted in front of the mirror can be changed to a much more effective process of planning your day. There are a lot of different advantages and disadvantages that full under this innovative idea; disregarding the actual purpose for its existence. One of the main advantages is the ability of the mirror to sync with your phones database, being able to update it easily. Furthermore, it does not require any type of physical interaction as it is embedded with a facial recognition system, that recognizes the user’s face and interacts with gestures that can be done by the user. As it all seems out of this world, there are always a few setbacks that affects the performance of the technology, starting with the need of a power source around the mirror to enable its function. This has caused a concern for a few potential buyers behind the safety measurements that has to be taken. Furthermore, the more technical difficulties that will occur in the field of facial recognition due to a lot of different odd reasons including, vapor in the air, weak room lighting or weak technology. We have all been tagged to photos on facebook that we are not actually in, due to weak facial recognition features. Zooming out of the benefits and downside, there has been a few concerns noted by buyers who are interested in the idea. These speculations were roaming around the need of a strong memory and a processor which, like any cloud, might have extra fees that are not explicitly stated. Such frustrating factors are always a turn off towards any product regardless how perfect it might be. Furthermore, the type of material used is important as it needs to withstand the daily use of a full house with all the rough events that might happen. Mirrocool endorses a few of the applications of the mobile phone or a notepad, which might be a point lowering its importance. However, we all reach the point of forgetting to check our calendars daily or being tired to check the weather or the time. Yet, having all these features right next to our image, in a very visible position is the main target that this technology provides. At the moment, there isn’t any direct competitors to the idea, yet it is expected that all the major companies out there can start a race which will escalate this technology to a whole new level. With MirroCool’s technology so advanced, there are always a few setbacks that affect the performance of the technology, starting with the need of a power source around the mirror to enable its function. This has caused a concern for a few potential buyers behind the safety measurements that must to be taken. Yes, MirroCool requires a power source, but it is designed to follow IP65 so it is safe. Furthermore, other technical difficulties that may occur in the field of facial recognition include vapor in the air, weak room lighting or weak technology. Those problems are not related to MirroCool. What can happen is MirroCool will not recognize a person – nothing happens – it will act as a regular mirror. The danger of recognizing the wrong person is very low with facial gesture recognition technology.